Riverford Field Kitchen reminds me of my childhood. I didn’t grow up on a farm or harvest an impressive veggie patch but what I do have really fond memories of is good, wholesome, home cooking. From my Nanna, my Pa and my Mum. It wasn’t fancy cooking but they knew how to make vegetables sing with flavour. And that is what I love about Riverford. Amazing organic produce which speaks for itself. 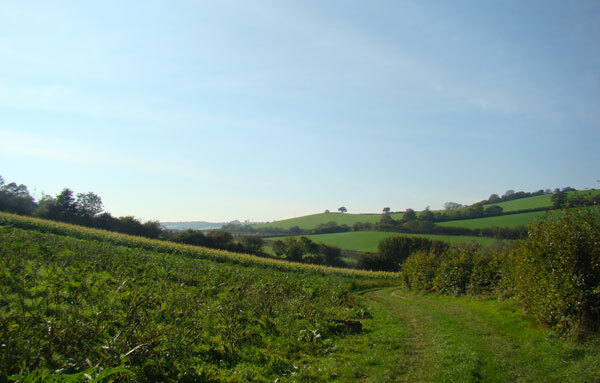 Set in the picturesque countryside of Devon, Riverford farm has been growing vegetables organically since 1986. It has been the passion and vision of Guy Watson to make fresh, seasonal, local produce available and affordable to homes around the UK which now sees around 47,000 veggie boxes delivered every week. The philosophy and driving force behind Riverford really is inspirational and I could blag on but onto the Field Kitchen which is nestled amongst the rolling fields and is run by head chef Jane Baxter. The set up here is simple. Freshly picked seasonal produce from the field to your table. The menu varies daily depending on what is being picked and the dishes are shared amongst large tables. Don’t let this discourage you because believe me there is plenty to go around! 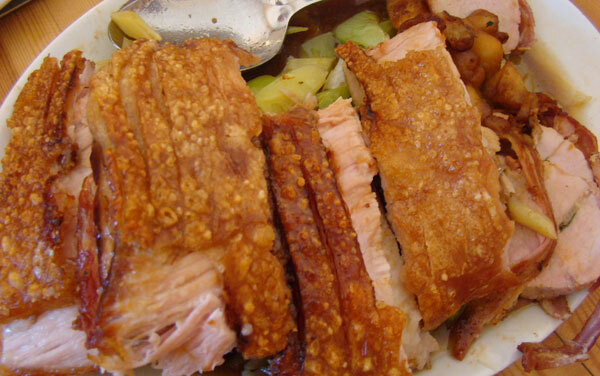 We were treated to roast pork, encrusted with crisp, crunchy crackling which was dangerously delicious. The pork was cooked with cider which made it really moist and gave it a slightly sweet flavour and was served with leeks and sage. 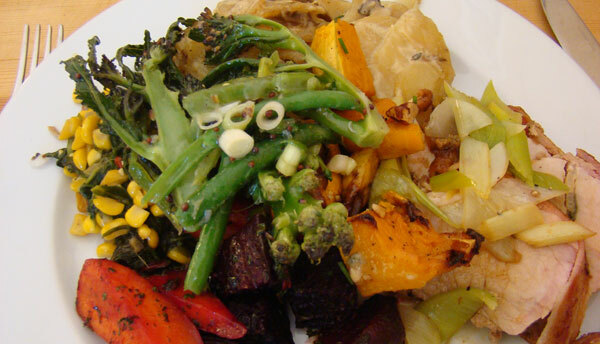 Five veggie dishes really do take the centre stage in the dining experience. A cheesy potato and mushroom gratin was seriously good and would have made a very comforting dish in its own right. I love my greens and often think I could live on them alone. This dish definitely confirmed that thinking! 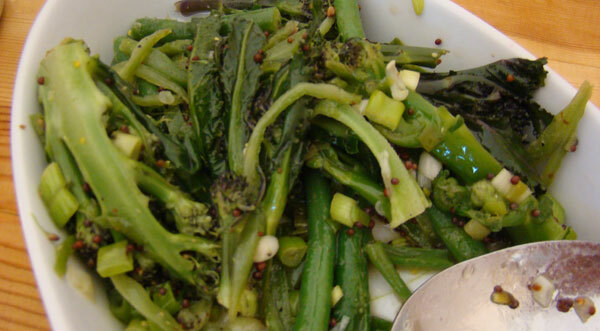 French runner beans and purple sprouting broccoli lightly blanched with a mustard dressing. The broccoli stems tender and the beans squeaky, perfect. 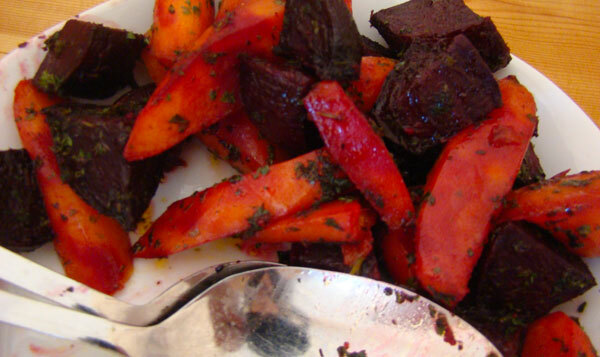 We were also treated to golden roast squash with blue cheese and spiced pecans and beetroot and carrots simply sprinkled with parsley. As I have mentioned all dishes are placed on the table to share which I know might make people nervous that they will miss out! But let me assure you the servings are so generous that you will in fact have the opposite problem of your eyes being bigger than one’s stomach. So don’t judge me on my piled high plate! And yes I ate every last bit! At this point you probably need to be rolled out of the Field Kitchen! But wait there’s pudding! I would recommend a brisk walk around the beautiful garden and to dig deep and find your dessert stomach – we all have one! Now they don’t just do one pudding, they do a pudding smorgasbord! A selection of totally drool worthy desserts are lined up from chocolate tart, pavlova with berries, blackberry crumble, apple cake, vanilla cheesecake, custard tart and the hero, the sticky toffee pudding, which I’ve been told is now a permanent fixture as there was total outrage when it wasn’t served! Having already sampled the absolutely stunning sticky toffee on a previous visit I went for the custard tart with quinces. And I wasn’t disappointed. 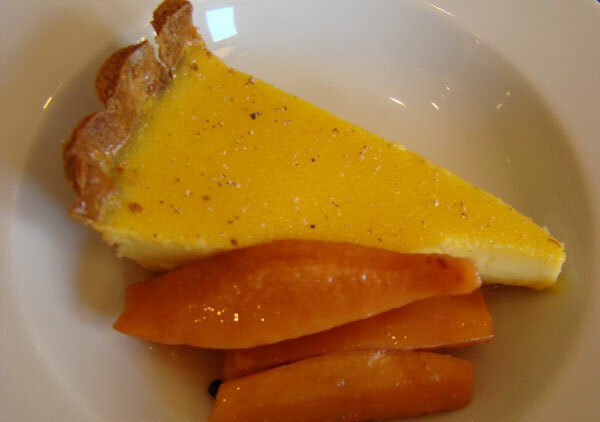 Only fresh organic eggs can give custard such a luminous yellow colour, and the tart was more savoury than sickly sweet. The tartness and granular texture of quinces was the perfect accompaniment. Riverford is a very special place and the Field Kitchen is such a lovely opportunity to enjoy the beauty of this farm and experience the joys of wholesome home cooking. I can’t recommend it highly enough and for just £19.90 for two courses at lunch and £26.50 for a three course dinner it is such incredible value. And if you don’t have it already I guarantee you will also walk away with the Riverford Farm Cook Book. It is my bible to cooking seasonal veg and keeps me going between visits to the Field Kitchen! Jeez, I only went there on saturday and this makes me want to go back again… There were loads of people pressing apples in front of the restaurant last week, it was amazing, young and old heaping apples into a crusher, then into an old juicer. It felt very Hugh Fearnley-Whittingstall, I kept looking around for the camera! Amazing place, you really put your finger on it – amazing produce that speaks for itself, cooked with respect. Hi Dan, they were making apple juice when I was there too. There was such a buzz going on (also from the bees! ), loads of kids getting involved, and we took away some gorgeous fresh juice. Such a great place, I will be back soon! 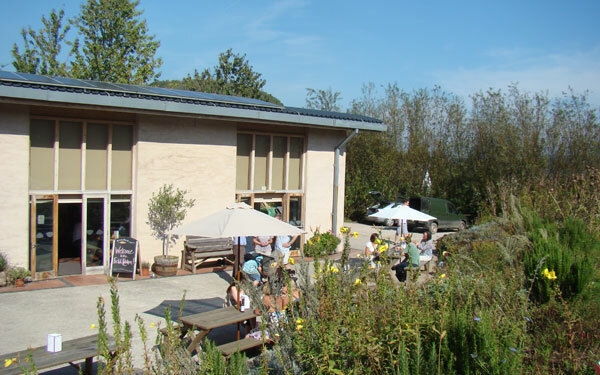 I love Riverford’s field kitchen, had lunch there this weekend – the custard tart was probably the best I’ve ever tasted. My favourite dish was a chard and fennel gratin which was sublime, especially when you consider those are the two vegetables I always avoid! Their latest cookbook has the recipes for the braised corn and sticky toffee pud. Hi Tasmin, I agree, I think they have the ability to turn all veggie haters into lovers! Just thinking about the sticky toffee pud is making me drool! Shamefully, given that it’s only an hour or so’s drive from us, I’ve only been once, but it lives on in my memory as one of the best meals I’ve had. 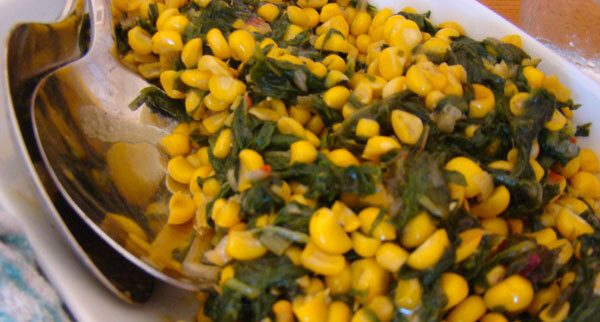 Despite the meat, it was a vegetarian’s dream – so many creative vegetable dishes – 8 when I went – mmmmmmm!